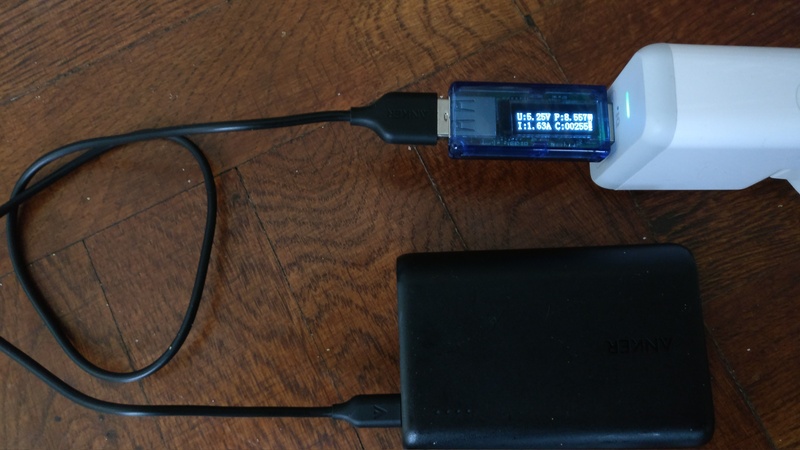 Get a USB meter tester and check your cables! Go Anker! 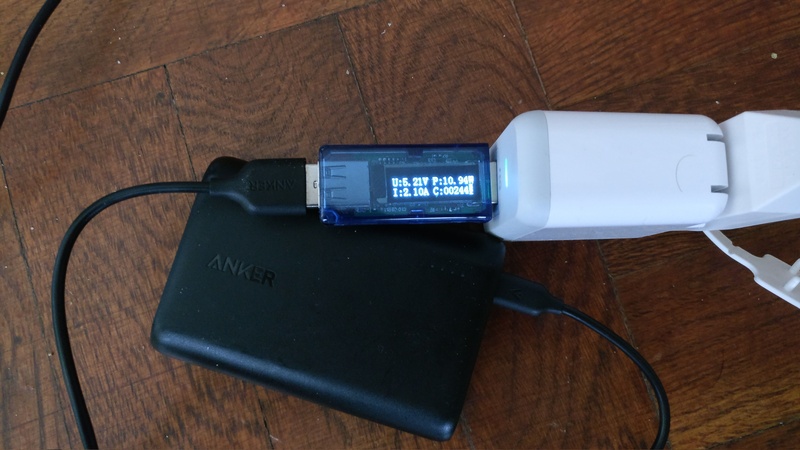 I am preparing for a roughly 4 week period being "off grid" a lot and I just got a USB tester to which voltage, amps, watts so I can find best cables, chargers. Quite interesting, I have now tested every cable. It does tend to align with what we are usually taught. I used a large capacity battery which is able to draw about 2.2A input act as load. A thin 6 inch cable is able to pass through full power, 2.2A. A 6 foot long Powerline+ cable was able to give 2A. A 6 foot Powerline was able to give 1.8A. So longer cables worse than shorter cables, and higher quality cables better than lower quality cables. A non-Anker 5ft cable was only able to give 1.3A. 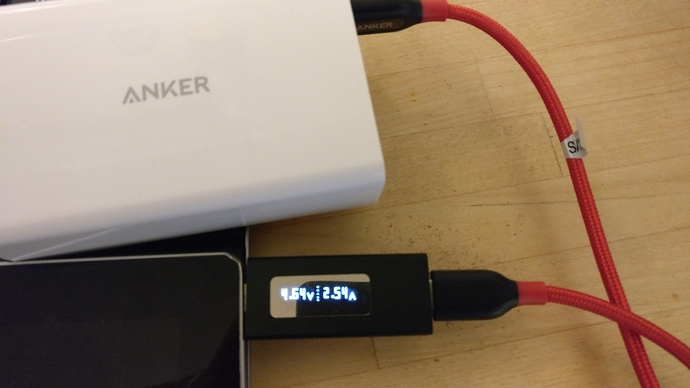 I also tried an Anker Powerport2 vs a non-Anker charger, and the Anker "Voltageboost" seems to be true in that the voltage became a little higher on a longer cable than the non-Anker make. If you're off-grid for a while and have brief on-grid times then the better the cables the faster the charge you get in any given time. If you are off-grid and using a portable charger then the higher the resistance in the cable the more of the energy is lost as heat. 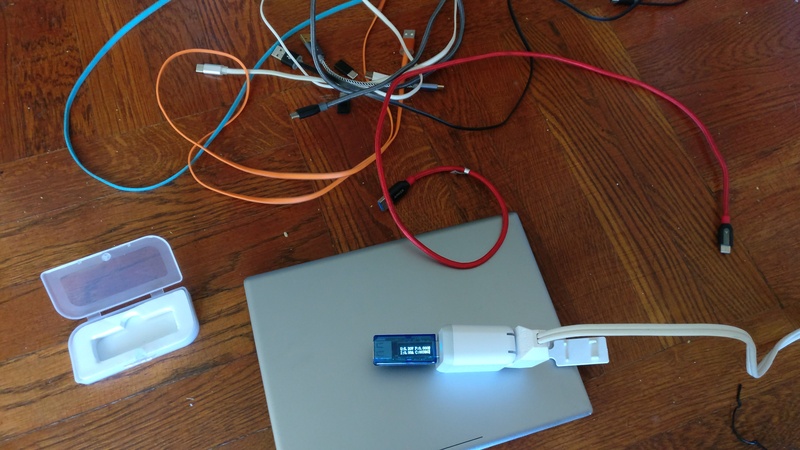 I know some testers use infrared heat temperature testers to find the precise source of heat, but I only bought a $15 USB tester to just test the parts. I recommend investing in a USB tester to take the theory and opinions out of any decisions where this matters. At home when you're in no rush or you have a big portable charger and dont need to worry about lost energy, then don't worry yourself. So I gathered all my USB Micro-B cables together and tested. Interesting result I would not have predicted. Firstly, the longer Anker cables were no worse than shorter ones and one of the short ones was a dud! 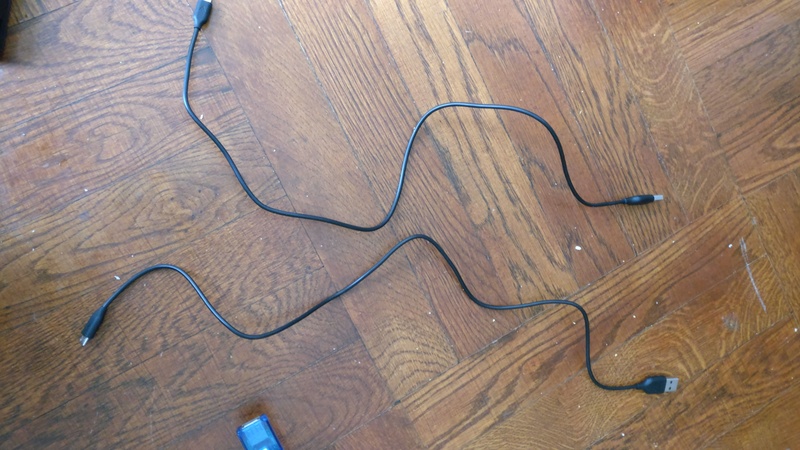 These two cables look the same right? One was unreliable in that it would give very different perfomance each time I plugged it in, sometimes it was nearly zero. Results overall were very similar with just that one dud. I then went through all the cables I could find and in total 5 bad cables and 15 good cables so in total 25% of the cables were bad. 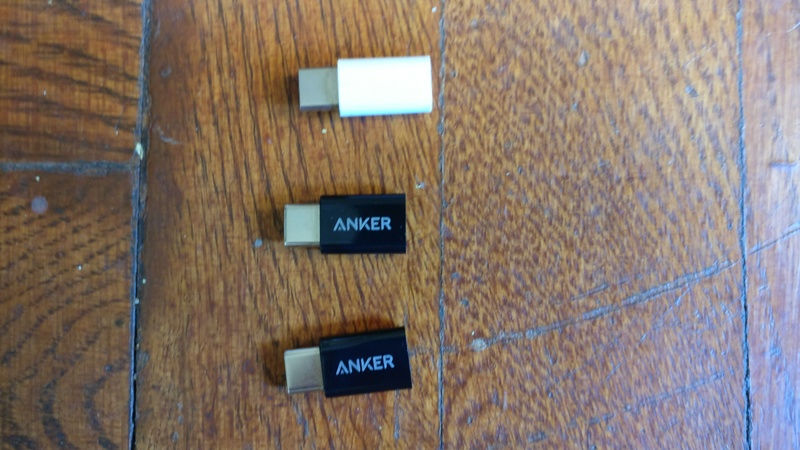 Only 1 bad Anker cable, one of the bundled ones you get with batteries, the other 4 were some other make including some ones I bought based on reviews before I stumbled in Anker. Nasty bad cables in the bin! I don't have much USB-C stuff, I have a Google Pixel C tablet which has a supplied 5V 3A charger, and a OnePlus2 with USB-C and a OnePlus3T with USB-C. I tested the OnePlus and it didn't seem to want to draw much power, but the Pixel did, able to draw 11W so I used that for testing.The Pixel was 50% charged, turned off and cold so it would draw the most it could. The Pixel being 3A input and the Powerport being 2.4A output you'd think they'd negotiate at 2.4A but they don't its the similar 2.2A you see with a non-USBC MicroB type device like a Powercore 10000. I'm guessing therefore it its not 3A its 2.2A. 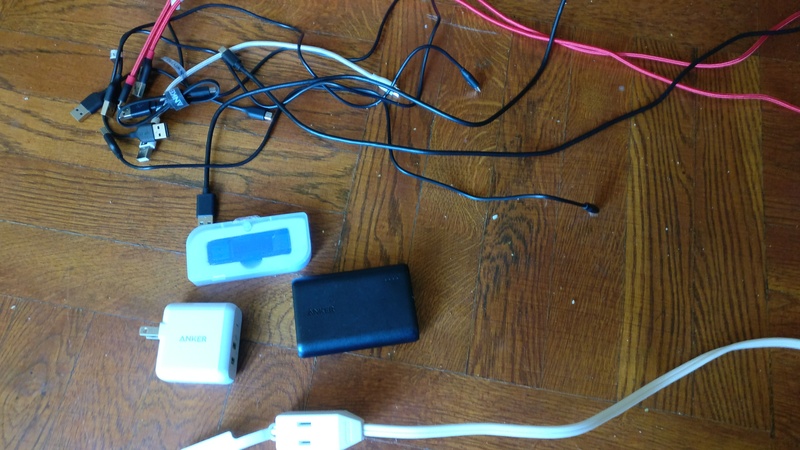 Testing setup is the tablet, Powerport 2, the Drok tester and the cables and adapters. 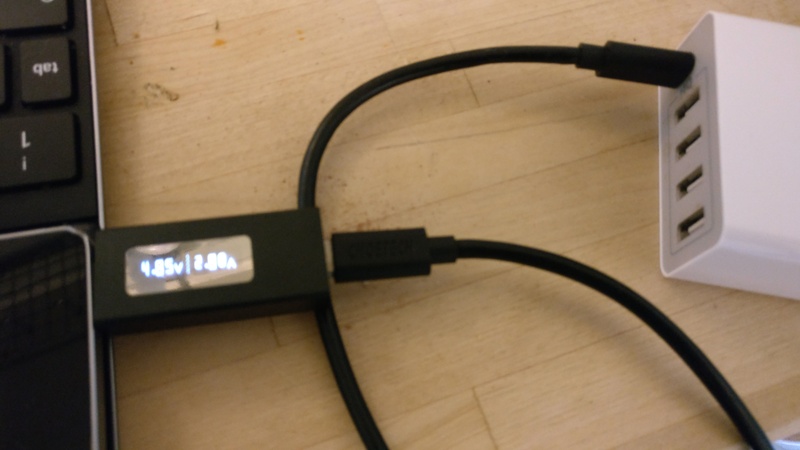 The surprise is that I had assumed a MicroB cable with a USB-C adapter with the connection between the two would lose some power, but it does not. Also (not really a surprise?) 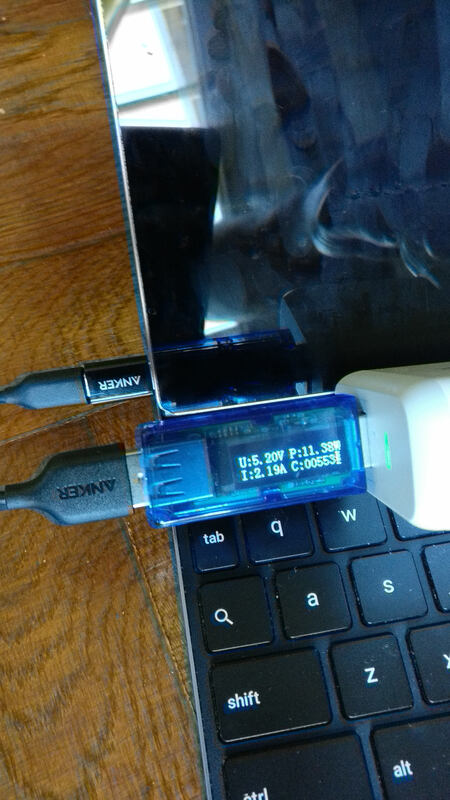 I bought a non-Anker USB-C adapter and it tested as failed. The Anker USB-C adapter is very good. Based on this I'd recommend the Anker USB-C adapters, they were on sale earlier. My very first non-Anker purchases of USB-C cables, I got when I got my OnePlus2 are bad, but having tested the OnePlus2 they probably are a good match as the cables can output roughly what the phone can ingest anyway, but for the Pixel tablet they are a limiting factor. Also you see VoltageBoost being applied, the bad cables, notice how the worse the Ampage the higher the Voltage as Anker VoltageBoost tries to up the voltage to make up for the losses in the cable. Clever stuff! It cannot fully overcome a bad cable but it helps, a little. These look similar right? It's only an adapter right? How can anyone make a bad one surely? Wrong! - buy other than Anker is a bad idea. - 2.4A of Powerport is not really there in this case, its 2.2A like you'd get with 2A type Micro-B situations. 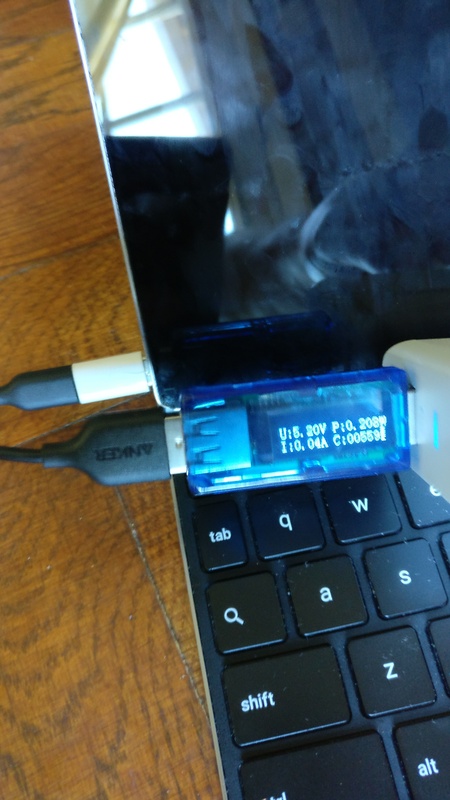 I only own a USB Type A ported tester so I cannot test say the USB-C port of my Powerport5 USB-C nor the USB-C cables (both ends), but I just now ordered a USB-C tester so I'll post in a few days those results. Once the family got home and the one Apple (cringe) fan arrived, I checked all the car chargers and the Lightning cables, testing using a iphone 6 and a ipad. The pertinent issue was the well documented problem with Apple devices that they lock themselves at the lowest current they witness, so for example if you plugged in an iPad into an Anker cigarette lighter and then started the car (turned ignition) the iPad would lock itself around 0.2A, vs if you then unplugged and replugged it would go up to 2.3A. I swapped an older Anker 24W for a newer 24W and the iPad went up from 2.1A to 2.3A, and I found the officially supplied iphone cable only able to give 2.1A vs another branded cable (not Anker) for 2.3A. So overall in the Apple ecosystem I found I could eek out modest improvements around 10%. Great tests. I always wanted those testers just for the heck of it, just to see if my chargers were truly outputting what they are supposed to and my phone was also accepting the most it could. I guess I'll be ordering one now. Good idea. I knew cables were the biggest problem but 1:4 cables bad!!!! 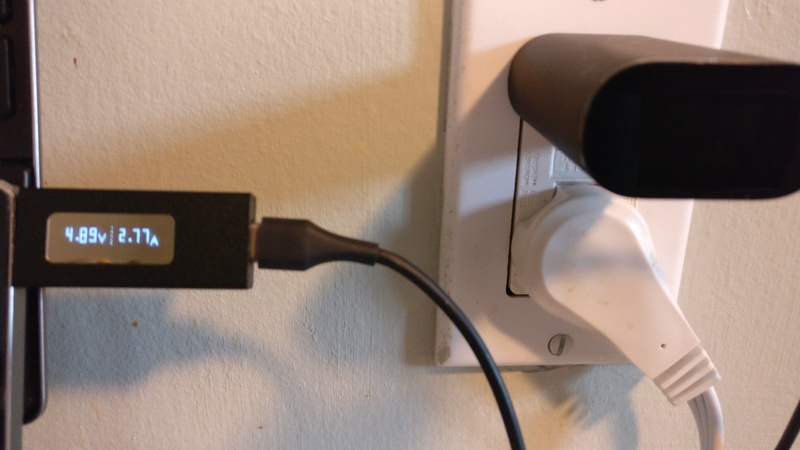 Also: why Anker (very low failure rate). Reminds me: let my tablet drain as I need to check the claimed 3A of 3 chargers (1 of them Anker). Final testing, I got a USB-C socket tester and now I can test if the claimed 3A output is real when using USB-C cables both ends and in a claimed 3A output 3A input tablet. I compared the Google supplied 3A wall charger, an Anker Powerport5 USB-C with claimed 3A output and a Choetech 6 port with 2 USB-C 3A output and 3 different cables from Anker and Choetech. I also then compared with a USB-C out of the 2.4A output. - Anker is no slower than the Google charger, about 2.8A, not 3A but note this could be limited by the tablet I was using but that's academic as that is the tablet I'd want charging. 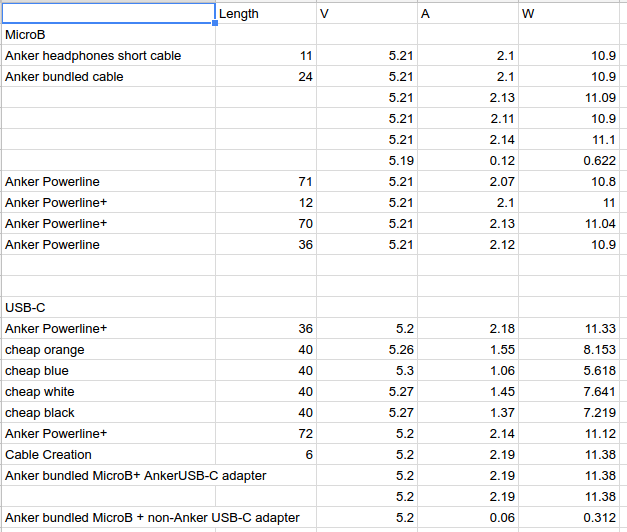 - shorter cables better than longer cables (which we kind of knew). - 2.4A output ports give about 2.2A so really for USB-C port you gain (0.6/2.2) about 27% faster charging. Useful, but not really necessarily worth lugging a specific larger charger. 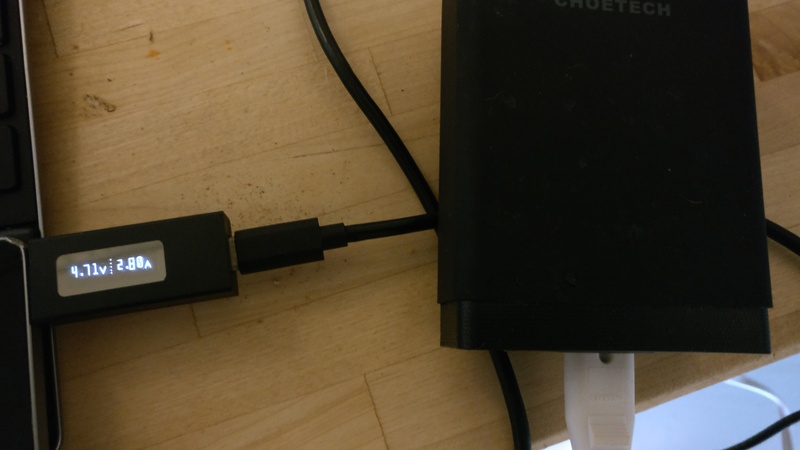 I think therefore I'm going to stick what I bought, that if I want to charge lots of devices including my tablet, the Powerport5 USB-C is a good reply, but if I want real compactness, a Powerport2 or 4 isn't that much slower. Porwerport5 means you have the long cable to the wall and then short USB cables on your desk, which is faster charging than a wallwart type with longer USB cables. 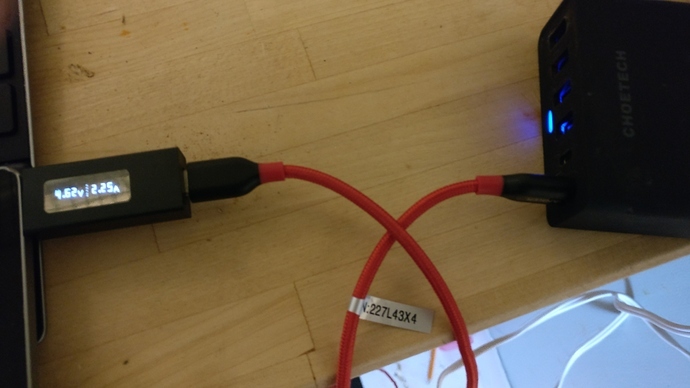 Powerport 5 "2.4A max" Micro-A to USB-C in short cable gives 2.25A, that is fairly consistent conclusion, that really 2.4A is more like 2.2A. 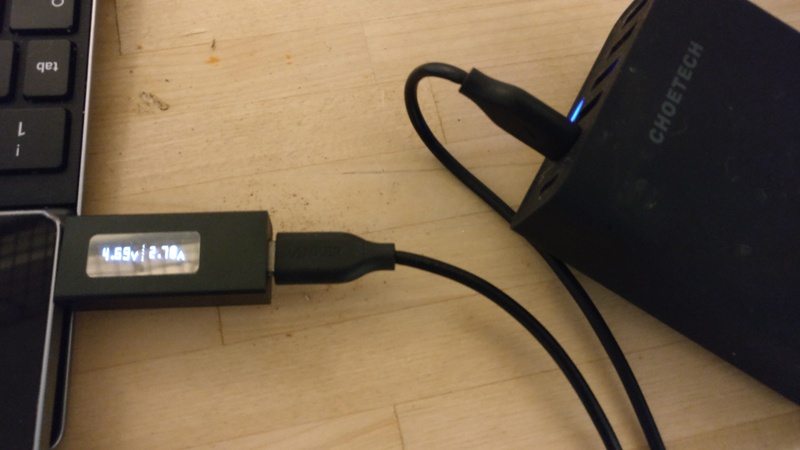 Powerport 5 USB-C on the USB-C port on a shorter 3ft USB-C both ends cable shows about 2.8A, not the 3A but that could be the tablet not capable of ingesting 3A. Same as above but with a Choetech USB-C to USB-C cable, about the same Amps. Choetech USB-C port on Anker cable, similar Amps. Powerport 5 USB-C using a longer Powerline+ USB-C cable, drops to 2.25A, so if you go with USB-C and a long cable you're losing all of the 3A gain in cable loss, no better than a 2.4A outpu port on a shorter cable. Choetech USB-C port with Choetech USB-C cable the same 2.8A we see with the cables not so long. 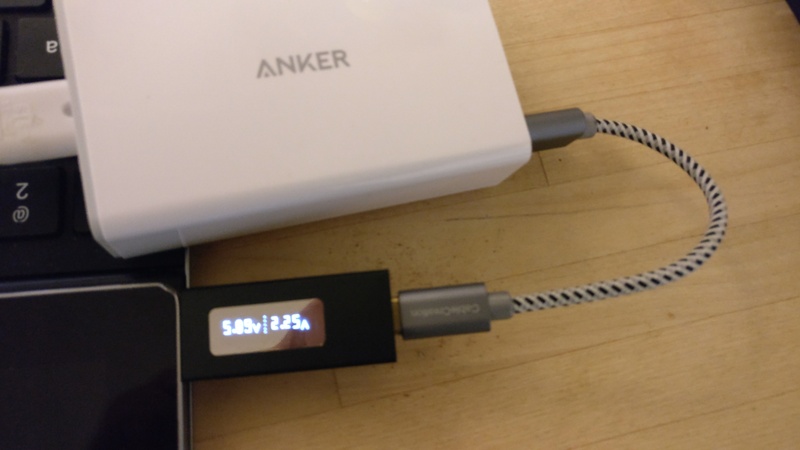 Choetech USB-C on the longer Anker Powerline+ USB-C cable, the same effect of dropping to 2.25A, so same conclusion, longer cables are dumb! The official charger 2.8A output. Powerport5 USB-C with the Choetech USB-C cable the same 2.8A we see when not using the longest cable. Anker didn't fail, no worse apart from its longer cable but that's just physics. I got a new tablet with USB-C (not PD) with a 5V 2A max input charging socket and been testing my cables and chargers to find good combinations. This tablet is where I don't need a keyboard and a smaller form factor of which being on a long flight is a good example. - shorter cables win, longer cables lose, regardless of make or "quality". A 6" cable performed best, 2ft worse.... 6ft worst. - Powercore is just as fast as Powerport. I tried a range of 2A output Powercore, the newer 6700, the 10000, 26800 and they all gave the same output with the same cable. - The idea of a wall charger and a long USB cable is not a performing combination. Fans of long USB cables should beware. - The use of the desktop charger with a long 110V cord and then a short USB cable is highest performance, or the equivalent of an extension cord with a wall charger with short USB cable. 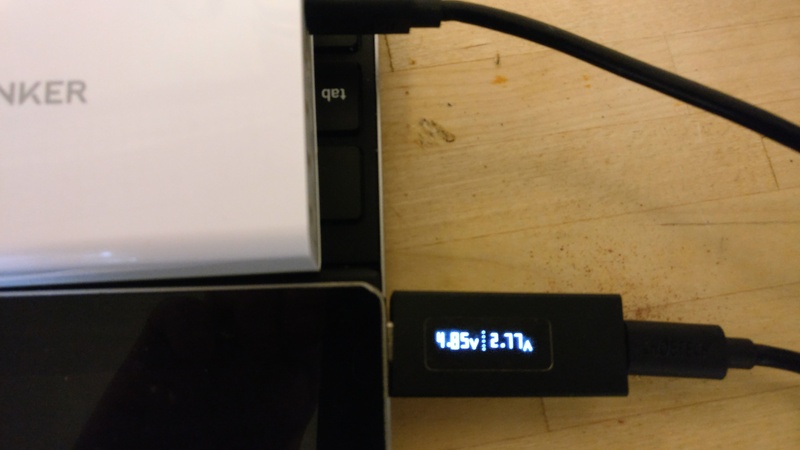 - Any desktop charger will do, pick your port count, and USB-C doesn't help performance. Your tables above didn’t show a big difference in speeds with longer cable lengths. Do you have some updated numbers? Yes they do with USB-C. I just looked again. 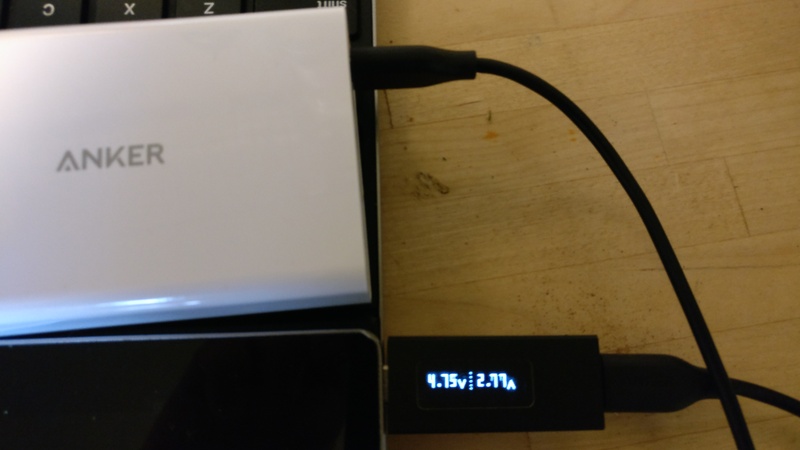 "Big" bear in mind my USB-C meter isn't showing Watts just Volts and Amps. I was curious as last night I had my Anker Powerport 10 recharging my 5V 2A USB-C tablet and it was recharging really slowly like 1% every 30 mins or so and after about 12 hours of recharge it had gone up from 40% to 68%. I was trying to debug the cause and it was the long cable I was using for convenience. This matters, I suspect less for USB-PD because there's more total Wattage and you're often battery limited on recharge anyway, but this 8" tablet is 5V 2A input on a 4850mah battery with a fast cpu so it needs every bit of that 10W to feed itself. I'll make up a table as I refine the solution for this different tablet, there is no real benefit for this tablet of 3A 5V. Glad I didn't get the other tablet 10" 7000mAh and still only 5V 2A, my 10" tablet is 9240mah and 5V 3A, the bigger tablets need higher Wattage input.